Linda Mummert here with some exciting news. 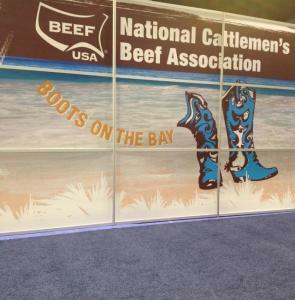 On February 6-9, 2013 at the Tampa Convention Center we welcomed over 5,600 delegates to the Annual National Cattlemen’s Beef Association. There were 250 exhibitors on the floor with various agricultural wares on site, live calves, all makes and models of tractors and anything else you could think of associated with the cattle industry. If you were interested in purchasing boots and cowboy hats there was a wide selection on site as well. NCBA occupied over 9,000 total room nights with an economic impact to Tampa Bay of $2,738,400.00. They were a delight to work with and we hope to have them back to our area real soon. It is over and out for now until next time.